The San Francisco Symphony’s coming 100th-anniversary season, announced in detail recently, will showcase the inventive and star-spangled programming for which the orchestra has become known. Highlights include a new incarnation of 2001’s successful “American Mavericks” festival featuring world premieres by John Adams and Meredith Monk, performances by celebrity soloists like Yo Yo Ma and Lang Lang, and visits by major orchestras including the Los Angeles Philharmonic and the New York Philharmonic. With a conductor like Mr. Tilson Thomas, it’s no surprise that there’s more to the coming season than classical music. The programming includes a swath of ambitious multimedia productions complete with video projections, theatrical sets and stages bathed in colored light. Works like “Polaris: Voyage for Orchestra,” a collaboration between the composer Thomas Adès and the filmmaker Tal Rosner (Sept. 29-Oct. 1), and the orchestra’s video-laced version of Claude Debussy’s incidental music for the mystery play “Le Martyre de Saint Sébastien” (Jan. 12-14, 2012) display the organization’s growing interest in presenting concerts that include a prominent visual component. Under Mr. Tilson Thomas, who became the orchestra’s music director in 1995, video-oriented programming has proliferated. In 2009 and 2010, the San Francisco Symphony performed the Japanese composer Nobuo Uematsu’s music for the Final Fantasy computer game series before packed houses of young people at Davies Symphony Hall. In the concert hall, the unremarkable score might have struggled to stand up by itself, but Mr. Uematsu’s lush soundscapes heightened the beauty of the “Final Fantasy” visuals projected on enormous screens above the orchestra, creating a holistic, immersive environment. Mr. Tilson Thomas’s passion for the theater has similarly made for memorable evenings at Davies Symphony Hall, even when he is not on the podium. The mise-en-scène for a semistaged December production of Mr. Adams’s oratorio “El Niño,” designed by Mr. Adams and Kevin Newbury, the stage director, brought out the warmth of the composer’s music through sensitive blocking that made use of both balcony and stage as well as costumes and dramatic lights. The centennial season promises more work along these lines with semistaged presentations of Bela Bartok’s one-act opera, “Duke Bluebeard’s Castle” (June 21-23, 2012), and “Barbary Coast and Beyond,” a quirky series exploring music written between the mid-1800s and early 1900s (May 10-12, 2012). With his strong theatrical roots, Mr. Tilson Thomas is better positioned to turn concerts into multimedia experiences than many other music directors. His grandparents Bessie and Boris Thomashefsky were Yiddish theater stars. In 2005, Mr. Tilson Thomas based a musical revue, “The Thomashefskys: Music and Memories of Life in the Yiddish Theater,” on them. “Michael Tilson Thomas has been at the vanguard of multimedia programming,” said Chad Smith, the vice president for artistic planning for the Los Angeles Philharmonic. Although Mr. Tilson Thomas relishes exploring the scenic possibilities of the concert hall, his strength as a stage director emphasizes subtlety over spectacle. 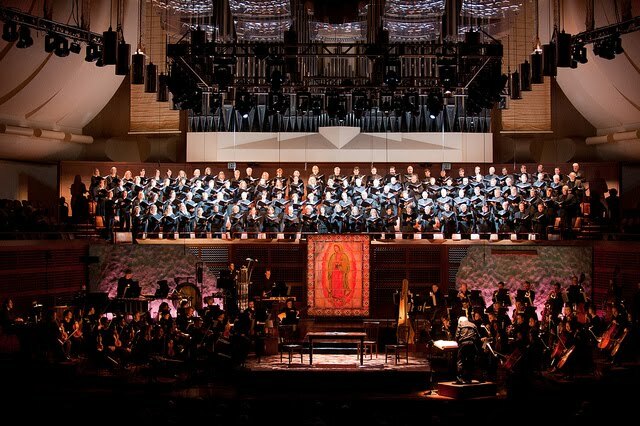 In the San Francisco Symphony’s recent interpretation of Morton Feldman’s “Rothko Chapel,” an ethereal composition inspired by the nondenominational chapel in Houston that houses 14 of Mark Rothko’s paintings, Mr. Tilson Thomas employed minimal visual cues to atmospheric effect. By bathing the chorus in contrasting pools of light and shadow and choreographing a slow, wandering path across the stage for Jonathan Vinocour, the viola soloist, the work eloquently evoked the meditative spirit of Mr. Rothko’s artworks. But the limitations of Davies Symphony Hall may also affect the straightforwardness of Mr. Tilson Thomas’s staging concepts. “Polaris: Voyage for Orchestra” had its premiere in January at the high-tech auditorium designed by Frank Gehry for the New World Symphony in Miami (where Mr. Tilson Thomas is the founder and artistic director) with video projections covering five huge screens. When the work is reprised at Davies Symphony Hall later this year, the projections will most likely be limited to three screens, according to Mr. Tilson Thomas. The drawbacks of the space aren’t preventing Mr. Tilson Thomas from thinking big, however. For the “Barbary Coast and Beyond” program next year, he plans to pay tribute to Adah Isaacs Menken, a 19th-century actress who caused a sensation in San Francisco for her risqué interpretation of the narrative poem “Mazeppa,” by Lord Byron.